Winter squash is one of those perfect foods, in my book. It grows readily here on our Texas homestead and can be stored as is with no additional energy input from the freezer or canner. It’s also downright tasty with some grass-fed butter on top. And that’s just how I most frequently serve it up – as a buttered side dish. But in order to eat plenty of the stuff I need to keep it interesting and so I came up with this dish. Freshly baked and buttered squash becomes the base of something warm, spiced, and delicious. Apples and onions come together for a sweet addition along with savory spices like garlic and ginger, which I like to feed my family on a regular basis for their immune-boosting properties. The buttery squash is the perfect juxtaposition to the spiced topping, making this a great meal to welcome in the fall season. Preheat oven to 375 degrees. Cut the squash in half, lengthwise and place in a 9×13 pan. Pour 1/4″ of water into the bottom of the pan and cover the pan tightly with a lid or foil. Place in preheated oven and bake 60-90 minutes or until tender. Meanwhile, heat the coconut oil over high heat until melted. Add the sliced onions and apples and fry for 10 minutes, stirring occasionally, until golden brown and tender. Stir in the beans, cayenne, cinnamon, turmeric, and ginger and saute two more minutes. 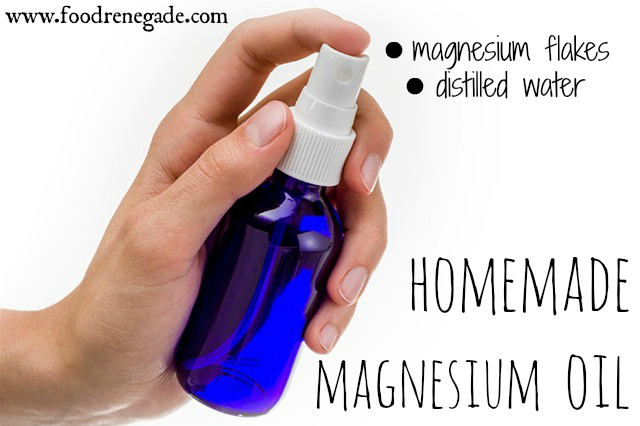 Remove from heat and add the honey and apple cider vinegar. Season with salt to taste. 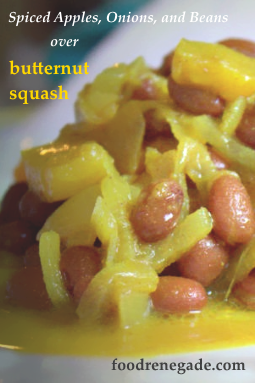 To serve, scoop the flesh from the squash while still warm, mash in a bowl with butter and sprinkle with salt. 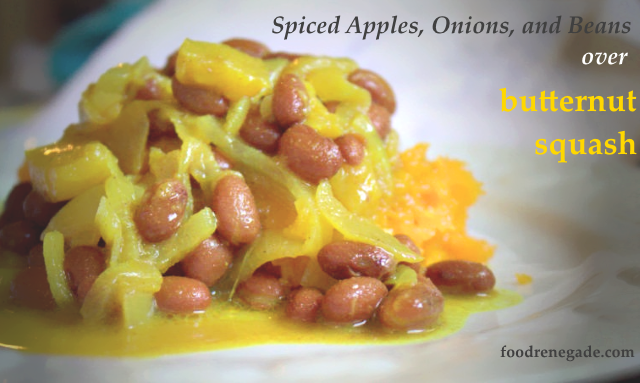 Scoop buttered squash onto plate and top with fried apple-onion mixture. Garnish with fresh cilantro, if desired, and serve warm. « Does the USDA Really Need Submachine Guns? I bet this would be yummy with the squash diced and roasted as well. We’ll have to give it a try – thank you! This is a recipe to be copied. It looks delicious and sounds even better. Beans and apples? That sounds like a fart factory. This looks crazy delicious!! I’ll be pinning, sharing and trying real soon, thanks for sharing!